Take what you already know about dehumidifiers and air purifiers and then go one step further. That’s where EZ Breathe ventilation system technology begins. Unlike other products, EZ Breathe's ventilation system is designed to prevent harmful moisture and humidity and stop molding in your home, not merely re-circulate moist, stale air. EZ Breathe does the work of several traditional dehumidifiers, and ensures clean, fresh air flows throughout the home. Using just 40 watts of electricity, the EZ Breathe costs on average $4 a month to operate with no maintenance hassles. Compare that to a traditional dehumidifier that can cost up to $30 a month to run. Plus the maintenance-free EZ Breathe will not harbor and spread mold and mildew throughout your home. It is also backed by an industry leading warranty. 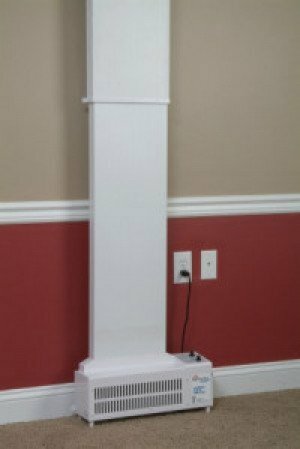 EZ Breathe's slim profile allows the unit to fit in most any space from a living area, to a laundry room, to a crawl space. It can even be installed behind drywall for a more finished look, and provide ultra-quiet operation. The ventilation system also provides a host of immediate, tangible benefits. These include helping to prevent and stop hazardous mold, musty odors and mildew, expel damaging moisture, irritating allergens, harmful pollutants and toxins, and providing a cleaner, healthier living environment. 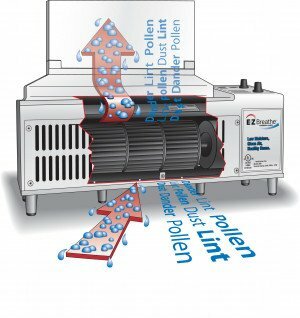 Cleaner, Healthier Living: The EZ Breathe Ventilation System Delivers. EZ Breathe tackles them all for noticeably cleaner and fresher indoor air.